Today was our department’s annual PhD Supervisory Panel at KTH during which PhD students are given the opportunity to get feedback from senior researchers who act as “guest supervisors.” To prepare for my meeting with two Associate Professors I reworked my research abstract and research questions following my 30% seminar in October, during which Johan Redström from Umeå Institute of Design acted as my discussant. My goals in today’s supervisory panel were to get feedback on the new scope of my abstract and research questions relative to being only about 40% through my PhD (and I’m sure will continue to evolve), and identify important areas that I need to work on articulating to more firmly position my research in the context of how I am conceptually “furnishing” my design space. Considering I was presenting to senior researchers from different academic backgrounds than my own and each other, it was especially helpful to see within which aspect I felt misunderstood, i.e. where I need to sharpen my arguments. Below my poster summarizing my research thus far, followed by a few notes/reflections based on feedback received today, and a textual version of my abstract and research questions. 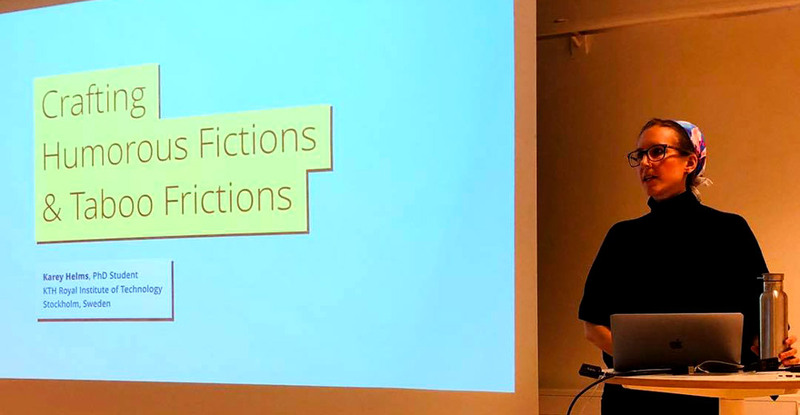 This entry was posted in AI / Machine Learning, Critical Design, Design Fiction, Human-computer Interaction, Implicit Interaction, Interaction Design, Internet of Things, KTH Royal Institute of Technology, Presentation, Research, Stockholm on December 12, 2018 by admin. For this year’s Advanced Project Course in Interaction Design at KTH, I’m fortunate and excited to have two groups of second-year master’s students working with me on two project briefs – Spying on Loved Ones and Tangible Designs for Effort, Exertion, and Exhaustion during Outdoor Experiences. Excited to see their resulting design work in December! To spy on someone is commonly thought of as a negative or harmful act during which one person secretly observes or collects information on another for malicious purposes. Yet, we also “spy” for many positive reasons. For example, these might include watching a sleeping child through a baby monitor, checking a partner’s calendar to plan a surprise birthday party, or browsing the fridge of an elderly parent to ensure a healthy diet is being consumed. What these examples have in common is that they are acts of care. This projects investigates how we care for others through technology, both with technologies explicitly designed to survey or observe others and through technologies designed for other purposes yet leak implicit information that enables spying. Within this investigation, various forms of spying will be classified and critiqued, the social and cultural implications of these positive intentions with be explored, and speculative prototypes will be designed to either further enable or inhibit spying. The project will follow the suggested steps: (1) a review and critique of technologies explicitly designed for spying in private and public spaces, (2) investigation into ways in which people spy on others through technologies not designed for spying, possibly through workshops, interviews, or cultural probes, (3) the design of speculative prototypes to either further enable or inhibit spying, resulting in an ecology of physical artifacts. Required skills include strong design sensibilities and an interest in critical design and design fiction. This project builds upon Leaky Objects: Implicit Information, Unintentional Communication. Multi-day outdoor activities such as hiking, skiing, cycling, and horseback riding involve full body engagement, during which bodies become sore and often endure physical transformations. Yet despite perceived discomfort and difficulties, outdoors experiences are often considered rewarding and relaxing. Thus, rather than designing to make these activities easier or more comfortable, this project investigates designing tangible artifacts and devices to celebrate or enhance these experiences of effort, exertion, and exhaustion. This project is part of a broader, ongoing outdoors project within the Smart Implicit Interaction project, and has the opportunity to build upon recent interviews with participants who have engaged in long-term outdoors experiences. The outcome of the project is open-ended, but students are expected to engage in a design process to that result in novel artifacts that are either proposed objects of use (e.g. products) or result in interesting new learnings (e.g. cultural probes). Students should have a design background or be interested in following a design process. 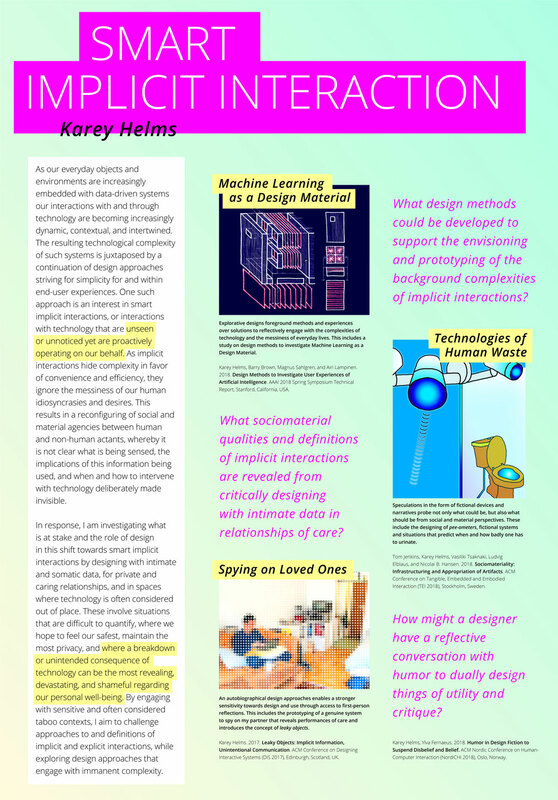 This entry was posted in Critical Design, Implicit Interaction, Interaction Design, KTH Royal Institute of Technology, PhD'ing, Physical Computing, Stockholm, Teaching on November 5, 2018 by admin.